Tangled and True: neighbor gifts. I've made it through the first crazy week of December. Next project neighbor and teacher gifts. I'm leaning towards the homemade granola in cute jars, but then I remembered I'd bookmarked these s'more kits via twig and thistle and can't decide. I'm convinced cute packaging could make anything a good gift. What are you making/taking this holiday season? 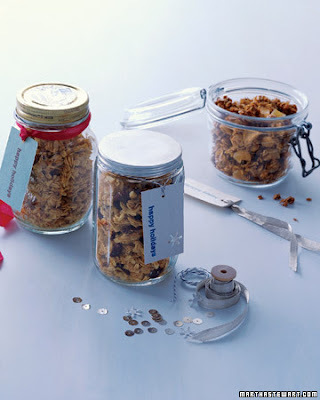 *photo taken from marthastewart.com and twig and thistle. funny you ask...I'm making granola! Funny you should ask...I'm making granola for some people too :0) I agree with the cute packaging thought though. And now I'm laughing b/c I didn't read the gal's comment above mine and ended up writing the same thing..."funny you should ask." Wow. You are a nice neighbor. I wish I had the time to give neighbor gifts. They will have to get a wave from me this year. 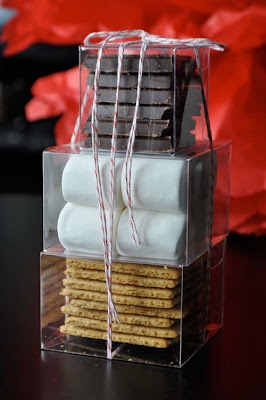 I love the smores idea...super cute. I'm sad that I've already purchased packing to make other snacks for our neighbors. I'll have to try and remember the smores next year! The packaging for the smores is so cute, where you could get that? WOW! How happy it would be if I receive such gifts!